Imagine opening the Bible here in Israel and standing at the very place where a biblical event unfolded! Today we are at the Abraham & Isaac Overlook in Jerusalem. Here Abraham and Isaac first beheld Moriah – place of the Sacrifice or Binding of Isaac, following a three day journey from Beersheba. Later King Solomon built Solomon’s Temple on Mount Moriah itself. 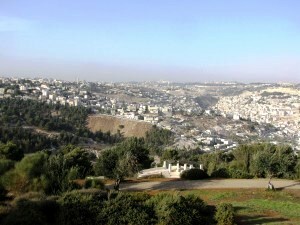 This particular spot on the southern end of Jerusalem is called by locals the Tayelet, which means in Hebrew “promenade”. I like to call it the Abraham and Isaac Overlook overlook since it’s where they beheld Jerusalem and Mount Moriah some 4000 years ago! I’ve been bringing groups here for years- to read and reflect on Abraham’s journey with Isaac from Beersheba, where they lived, to this very spot. God had called Abraham to sacrifice his son Isaac and with a heavy but obedient heart sets out on the three day journey, without of course letting Isaac in on the details of exactly what was happening. For more info about visiting the overlook where Abraham and Isaac first beheld Mount Moriah in Jerusalem and where Solomon’s Temple was built contact Zack Shavin, veteran Israel guide and biblical archaeologist at Land of Israel Tours. This entry was posted in Jerusalem and tagged Abraham, Akeda, Binding of Isaac, Israel, Jerusalem, Mount Moriah, Sacrifice of Isaac, Solomon's Temple by zshavin. Bookmark the permalink.